The following article is based on the book A New Approach to the Chronology of Biblical History from Abraham to Samuel and The Biblical Chronologist Volume 2, Number 2. Further details and references can be found there. The Bible indicates that the same Pharaoh whose daughter adopted three-month-old Moses died when Moses was nearly 80 years old! This Pharaoh must have reigned for a very long time. Only one pharaoh in the history of Egypt can meet this Biblical requirement---Pepy II. So there is a good fit between the secular history of Egypt and the Biblical account with these two pharaohs; an extremely long reign is followed by a very short reign, as required. The Biblical account of the ten plagues is quite detailed. It describes the pollution of the water supply, and devastation of the livestock and vegetation of the land. The Israelites left, depriving the land of its slave labor, and they carried away much of the land's wealth in the form of silver, gold, and clothing (Exodus 12:36). Also, the army and the Pharaoh were drowned in the "Red Sea," leaving the country with weakened defenses. The Exodus must surely have left a bold signature in Egyptian history. What do the historians find following the reign of Pepy II's successor? This time period was characterized by famine, an expected result of the plagues described in the book of Exodus. This famine was limited to the Nile valley (Grimal, page 139)---as the Bible's narrative would lead one to expect. There was anarchy and a struggle for political power. Egypt's foreign trade ceased and Egyptian mining in the Sinai peninsula "also seems to have been abandoned" (Grimal, page 139). The nation of Egypt had obviously suffered a severe blow---as one would expect from what the Bible tells us of the events accompanying the Exodus. The match between the Bible's narrative of the Exodus and the secular history of Egypt at the end of the Old Kingdom might possibly be brushed aside as coincidence were it not for the fact that this match happens at the right date according to modern Biblical chronology. Dr. Aardsma's chronology places the Exodus 2447+/-12 B.C. The current "standard" chronology of Egypt places the end of the Old Kingdom---when the evidence discussed above says the Exodus happened---around 2200 B.C. The difference of 247 years between these two dates is close enough for such ancient times to regard the dates as the same. Uncertainties of a few hundred years in historical/archaeological chronologies are normal at such early times in the history of civilization. Nicholas Grimal notes that "The chronological span of the First Intermediate Period [which must be known to date events in the Old Kingdom accurately] is also a problem." Haas et al. have suggested, based on an extensive suite of radiocarbon dates (totally independent of Dr. Aardsma's work), that the First Intermediate Period should be lengthened by about 260 years. This would push the secular date for the end of the Old Kingdom back to around 2460 B.C., indistinguishable from Dr. Aardsma's Biblical date of 2447+/-12 B.C. for the Exodus. Pottery analysis in the Sinai Peninsula by E. D. Oren and Y. Yekuteli is also supportive of this adjustment. Thus the qualitative match between the Bible's narrative of the Exodus and the secular history of Egypt at the end of the Old Kingdom is supported by quantitative chronology. Grimal, Nicolas A History of Ancient Egypt Cambridge, MA: Blackwell Publishers Inc., 1993. 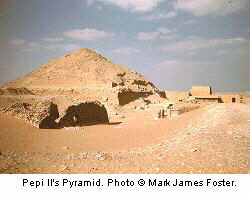 Photo Credit: Thanks to Mark James Foster for permission to use his photograph of Pepy II's Pyramid. The foregoing article was based on the book A New Approach to the Chronology of Biblical History from Abraham to Samuel and The Biblical Chronologist Volume 2, Number 2. Further details and references can be found there.